Almost every day, Pannalal Meghwal parks his scooter on the edge of the informal work hubs called nakkas in Ahmedabad, India, armed with registration forms and a fine-tuned sales pitch. The good-humored social worker makes his way through hundreds of lanky construction workers clustered around a chai peddler as they wait for contractors to ride up on motorcycles and hire them for the day. It can take some convincing, but the laborers desperately need what Meghwal has to offer: a simple laminated identification card. Most have traveled from rural areas in other states to find work, leaving behind their village homes, families and identifying documents, which are often accepted only within the state. Without local IDs, their already unstable lives become even more difficult: They can’t access food subsidies, buy local SIM cards for their cellphones, open bank accounts or protect themselves against abuse from unscrupulous employers. The government initiative meant to address this issue, a controversial national identification card program called Aadhaar, offers a 12-digit personal ID with biometric data. It was initiated in 2012 by India’s Unique Identification Authority, but its distribution has been fraught with corruption. The ID system has failed to reach 30 percent of India’s 1.1 billion people, in large part the poorest. In the meantime, the low-tech, quasi-official card that Meghwal offers is being provided on a smaller scale by a nonprofit organization, the Aajeevika Bureau, which focuses on assisting migrants and is recognized by some Indian state governments. To date, it has provided benefits to 82,232 migrant workers and hopes to continue trying to fill the gap until the government program becomes more universal. Within India and China, a vast migration, virtually unnoticed, occurs every day. Tens of millions of seasonal workers, who live high-stress lives shuttling between city slums and rural villages, are vulnerable to wage theft, injury on the job and life-threatening illness from their risky lifestyles. On summer days in Ahmedabad, when temperatures hover near 120 degrees, Meghwal sets about looking for men who fit this profile. These are the workers that the Aajeevika Bureau has been focused on supporting for 10 years with its flagship identification card program. Identification is a tricky requirement in a country caught in the flux of large-scale urbanization — with millions of people leaving their villages to search for employment as the once dominant agriculture industry changes and shrinks. More than 300 million of India’s people are migrants, which means they left their birthplace or last residence in the past decade, according to a 2013 United Nations development report. And those statistics often leave out thousands of seasonal migrants, usually 20- to 30-year-old men who leave their native homes every few months to lay tiles or make bricks in a city, according to a 2014 Aajeevika Bureau report. Since states in India have great diversity in their local languages, customs and politics, this transient population can easily go undocumented in their new homes. Gujarat, for example, requires migrants to live within the state for at least 10 years to receive government-issued identification like a voter ID or ration card to access food and health subsidies. That’s where the Aajeevika Bureau, founded by a rural activist, Rajiv Khandelwal, has made its mark. Khandelwal, who had been working in Rajasthan, a state in northern India, thought up the identification cards when he saw many young men leave their villages because farming or local enterprises produced too little money. In nearby cities like Ahmedabad and Surat, both in Gujarat, he noticed the workers were treated like “an invisible population” — useful for India’s growing economy, but without any citizenship or identity in their second homes. He thought identification cards with the Aajeevika Bureau branding could help establish the seasonal workers in an informal, cash-only economy. The Aajeevika cards are laminated and include the local address, birthday and other basic information in English and Hindi. The only government that recognizes them so far is that of Rajasthan, where the Aajeevika Bureau is based but from which many migrants leave to work in other states. Even so, given the informal nature of most migrant labor markets, Khandelwal said the mere existence of the card goes a long way in establishing identity. Pulling a checkered button-down over his white undershirt after a long day, Darilal Bunker, a construction worker originally from Rajasthan, got ready to make a group dinner at his one-room home in the crowded Ahmedabad slum colony called Majdoor Gaon (Labor Village). The cramped quarters were filled with working men – they live sometimes 10 people to a room in crude metal and concrete structures. Bunker, a spindly 45-year-old, said the Aajeevika card was one of the first pieces of documentation he had in Gujarat, and the only one that has his current address. 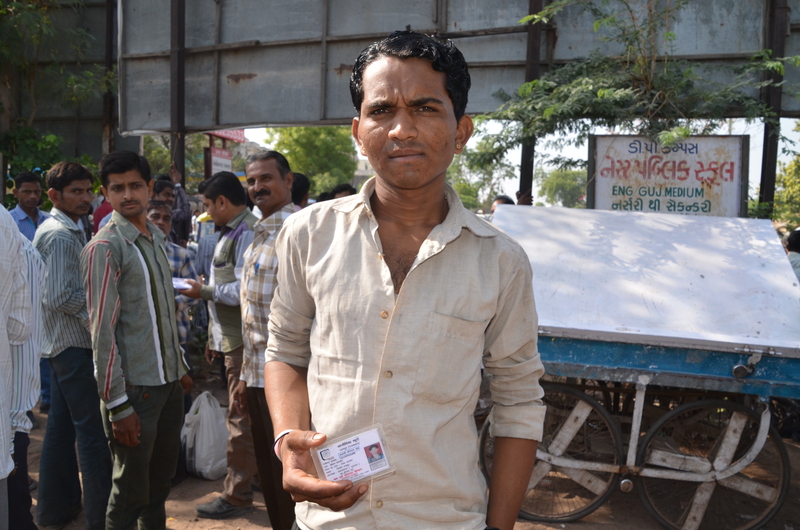 Even after 25 years of shuttling between his village in Baswari, Rajasthan, and Ahmedabad, Bunker hadn’t been able to get any other form of identification showing his local address, though he had a Voter ID card with his village home’s location. So far, he said, the Aajeevika card had proved useful many times — when being questioned by the police at 2 a.m. while coming home from work, and when he sought an account at the State Bank of India. His ability to verify an affiliation with the Aajeevika Bureau has also helped him in the face of employer abuse or when contractors cut promised wages or delayed paying their workers. He’s been hurt several times during his job laying cement and working with stone — once falling from a second story. Having the backing of a larger organization helped him receive compensation and fairer pay. The success of Aajeevika’s identification cards and related programs for migrant workers has helped the group forge a relationship with national and state officials. Officials in the Balipatna district in the eastern state of Orissa, another rural base for seasonal migrant workers, have started to sign and authorize the Aajeevika Bureau cards, for example. On a national scale, the organization signed a memorandum of understanding with the countrywide Aadhaar program in 2010 as a first step toward establishing a more universal identity card. But the Aadhaar program’s bureaucratic and legal challenges have left activists complaining that it requires too much intrusive information. Last year, the Supreme Court of India appeared to agree when it ruled that citizens couldn’t be denied benefits for not having the card. In Ahmedabad, city labor department officials have been working with the organization to develop their own policies and programs for what they estimate to be about 400,000 migrant workers, according to the assistant labor commissioner, M.S. Patil. Patil said the government had raised the minimum wage by about 20 percent, to 280 rupees ($4.50) per day, although he acknowledged it had not done an official survey of the workers or their needs. Still, he said, consulting with Aajeevika has helped officials better understand the workers’ lifestyles and disseminate information through worker collectives and unions that the organization supports. Just a few miles away from Patil’s office, Pushpa Yadav, a migrant worker from Chhattisgarh, one of India’s poorest states, nursed her baby while squatting on a pile of sand at a construction site for a new mega mall. Entire families of migrant workers from Chhattisgarh had relocated from their villages and pitched makeshift tents amid the scaffolding and bricks. Yadav, 25, said her husband had been working on the site for four months, and they were relying on their collective salary of 500 rupees ($8) per day to buy wheat, flour and potatoes for their meals. She had a voter ID from Chhattisgarh, but said most of her documents like birth certificates or health insurance cards had been lost or left behind during the constant hustle to find work in different cities. Without local identification she isn’t eligible for nutrition and food programs, and her children don’t go to school. If someone gets sick, Yadav said, it’s easier to go to a cheap private doctor and pay out of pocket than spend hours waiting at a government hospital. The Aajeevika Bureau hopes to reach more of these workers who otherwise slip through the cracks. At the site where Yadav works, the organization opened a day care center to engage the children, who otherwise help their parents under the hot sun or play at the dangerous site. With its flagship identity card having put the Aajeevika Bureau on the map, Khandelwal said it is branching out to try to provide the migrants with more services like skills training, access to unions and community kitchens at both their home villages and the cities where they work. A new emphasis on legal programs has already helped workers recover more than 35 million rupees (about $565,000) from contractors who hadn’t paid them promised wages. Meanwhile, field workers like Meghwal continue to visit the nakkas every day, registering workers for identification cards one by one. Sitting on a bench with a group of men before they were hired for the day, he carefully explained to the youngest, 22-year-old Sambulal Mena, how to get his card authorized by his village leader back in Rajasthan. As Mena prepared for another day of working under the blazing sun, he wearily listened to Meghwal’s instructions and sipped from a cup of chai. He thought about going home to his village, where his family lives on the farm, unaware of the harsh conditions he is enduring in the city because many migrant workers put on clean clothes and brave faces when they go home.